After Lynsey was away backpacking in the Lakes last weekend and I was away the previous weekend in Glen Etive, we decided to have a quiet weekend this weekend. So this morning we headed over to Dunham Massey, where Isabel had great fun running around the garden. 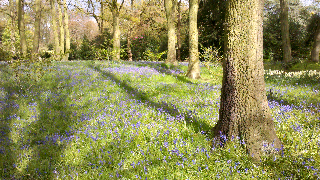 There were also lots of bluebells in flower, which were nicely lit by the morning sun. Yes there was indeed sun here, although not all day. I thought you needed the rain down your way anyway?